Rudy Rucker's All The Visions is a non-stop stream-of-consciousness memoir from the early 1980s and only recently published, that gives us Rucker from the inside out. Life, love, drugs, music, mathematics, the '50s, the '60s, death, madness, fatherhood  he covers them all like a non-stop updated Kerouac. 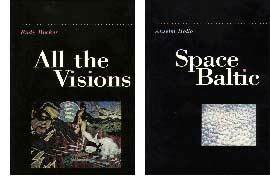 Presented in an upside-down-and-back-to-back format with Anselm Hollo's Space Baltic, a volume of poetry influenced by science and science fiction, from the author of more than 20 books of verse.